The president of Kuki National Organization (KNO) and the self-styled commander-in-chief of Kuki National Army (KNA), P S Haokip, on Thursday cautioned both the Central and Manipur Governments that the group will not hesitate to go back to the jungles if the right of the Kukis to govern themselves is not respected. 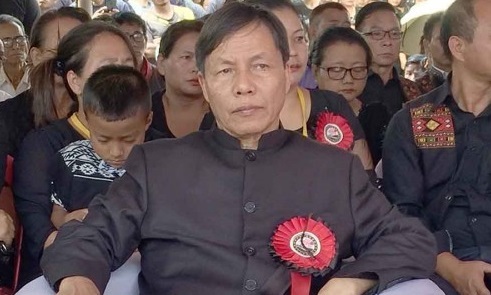 The KNO stated this during the concluding day of the three-day Kuki black day observance held at Kuki Inpi Complex in Tuibong at Churachandpur district of Manipur. This year marks the 25th anniversary of the genocide allegedly perpetrated by cadres of NSCN-IM during the ethnic clash from 1993 to 1997 on the Kukis. This year the event was organized with three-day programmes starting from September 11 that included prayers, testimonies from victim’s families. Kukis from different parts turned up in thousands to attend the rituals. While substantial talks is yet to begin, the group has reportedly prepared a 45-point charter of demands with ‘territorial council’ as priority to be tabled in the next round of talks, the KNO chief said. Urging the Central Government to stop dilly dallying with the group, he warned the government that they are ready to go back to the jungles if talks are not fruitful. The KNO president also expressed his discontentment over the failure of the government to deliver justice to the victims of genocide. The governments, both at the Centre and the State had not only turned a blind eye to the massacre committed by Th Muivah and his band of marauders, but also shunned their ears to our cries for justice for a quarter century now, he alleged. Haokip further clarified that Kuki black day observance is not intended to create animosity between any communities. It has been 25 long years since that fateful day of September 13 in 1993 when the NSCN-IM-led killers mercilessly butchered more than 100 of innocent and unarmed Kuki villagers in a single day.